(AP) LONDON - Myanmar's opposition leader, Aung San Suu Kyi, warned Thursday that her country's people need Britain and other allies to act as watchdogs, and not cheerleaders, to ensure its rulers deliver on their promises of reform. Making an historic address in London to a joint session of both Houses of Parliament, Suu Kyi said Myanmar - which she referred to by its British colonial name of Burma - would need sometimes critical support to fully embrace democracy after 49 years of military rule that ended only last year. "I am here in part to ask for practical help, help as a friend and an equal, in support of the reforms which can bring better lives, greater opportunities, to the people of Burma, who have been for so long deprived of their rights and their place in the world," Suu Kyi said in Parliament's 11th Century Westminster Hall. "My country today stands at the start of a journey towards, I hope, a better future. So many hills remain to be climbed, chasms to be bridged, obstacles to be breached," said Suu Kyi, who was cheered and given a standing ovation by British legislators. "Our own determination can get us so far. The support of the people of Britain and of peoples around the world can get us so much further." 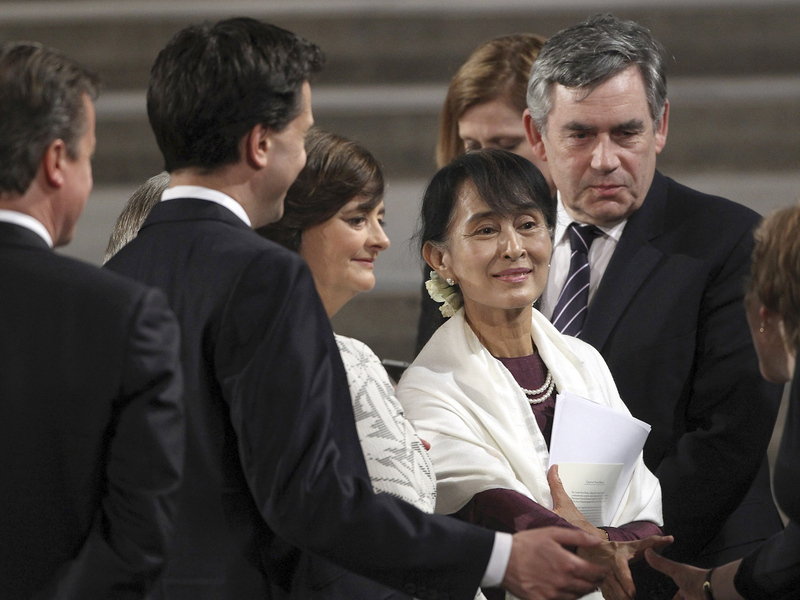 Suu Kyi is the only woman other than Queen Elizabeth II to deliver a speech to a joint session of Parliament at Westminster Hall, and follows dignitaries such as South African President Nelson Mandela, Pope Benedict XVI and U.S. President Barack Obama. The honor is usually reserved only for heads of state. The, who spent 15 years under house arrest or imprisoned in Myanmar, is making her first overseas trip in 24 years. She has visited Switzerland, Norway and Ireland and is spending a week in Britain, where she previously studied and lived. As she was greeted by British Prime Minister David Cameron at his official 10 Downing Street residence, Suu Kyi said she remembered that her father, Myanmar independence leader Aung San, had been photographed outside the famous house, wrapped in a large British military-issue coat to protect against the cold. "I must say, not having left my tropical country for 24 years, there have been odd moments this week when I have thought of that coat myself," Suu Kyi told lawmakers. "I was photographed in the same place where my father was photographed and it was raining - very British." Britain is among Western nations which have suspended sanctions against Myanmar following President Thein Sein's moves toward political liberalization since he took office in 2011. Cameron said Thursday he had invited Thein Sein for talks in London, which follows a meeting between the two in Yangon in April. "There is a process of reform in Burma," Cameron said, as he held a news conference with Suu Kyi. "In order for that to succeed we have to work with the regime." Suu Kyi said she supported Cameron's decision to host Thein Sein in London, and urged the U.K. and others to act as a watchdog on Myanmar's reforms. "More than ever we need our friends to be watchdogs. You have to watch what is going on in Burma," she told Cameron. Suu Kyi, who also held talks with Prince Charles and his wife, Camilla, said she hoped Myanmar's parliament would one day enjoy the same circus-like atmosphere as the raucous weekly Prime Minister's Question Time session in Britain - when Cameron and his opponents trade noisy verbal blows. She was sworn in as a member of Myanmar's parliament in May, but said that so far she had found the tone "rather formal." "There is certainly no heckling. I would wish that over time perhaps we will reflect the liveliness and relative informality of Westminster," Suu Kyi said in her address.